Player Card and Ballpark Card Examples. Images Not Included but can be added after purchase by end user. Whether the action is on the gridiron, ice, court or diamond, each sport comes to life as the players and individual match-ups decide the outcome of every game. Every time a Quarterback throws a pinpoint pass, a Goalie stands on his head, a dominating Center throws down a power dunk or a pitcher shuts down an opposing lineup, the picture will be painted in front of you as though you were living the experience from the sideline, rinkside, courtside or on the dugout steps. This picture comes into focus through an intuitive game design that translates true life athletic action into realistic play results on your tabletop. No matter the sport, games are won and lost because athletes make plays or fail admirably in the attempt. You will shake your head every time you call the perfect pass play but your receiver drops the ball or a defender tips the ball away at the last second! You will groan every time a beauty of a goal is stolen from you when a Goalie makes a big save giving his team a burst of momentum! You will smile when your athletic forward slices his way to the rim and dunks the ball over a Center the height of a redwood tree! You will breathe a sigh of relief when your center fielder races toward the gap and makes an outstanding sliding catch to take away an extra-base hit! As these images and games come to life, feeding your imagination through each ordinary, big or spectacular play, you will truly . . .
FEEL THE PULSE OF THE GAME! SIDELINE FOOTBALL - a full simulation of the game of football. Players block, pass, run, tackle and kick just like in real life. Tons of Offensive and Defensive options available including Offensive and Defensive Coordinators. Historical and Projection Seasons available for Professional Football. A Projection Season is available for College Football. RINKSIDE HOCKEY - a full simulation of the game of hockey. Players skate, stick handle, pass, hit, fight and save pucks just like in real life. A fast-paced game involving all 3 Zones: Offensive, Neutral and Defensive. Seamless game flow built around Offensive and Defensive strategies as well as how aggressive a team is in taking the body. Momentum plays a factor and a chippiness meter monitors the rough stuff on the ice. Historical Seasons will be available. COURTSIDE BASKETBALL - a full simulation of the game of basketball. Players pass, shoot, rebound, block shots and play defense just like in real life. A flowing game built around Offensive strategies including pace of play, choosing to work the ball inside or focusing on perimeter play. Pick & Roll is involved as well as a player's ability to create offense for teammates. Both Team and Individual Defense is involved in every play; a simple but detailed rebounding system that includes put-back dunks, tip-ins and triggers that lead to Transition or Fast-Break Offense. Momentum and Physical Play are factored in. Historical Seasons will be available. DUGOUT STEPS BASEBALL - a full simulation of the game of baseball. A highly detailed Pitcher-Batter interaction that seamlessly involves Fielding and Park Factors. Pitchers, on any given day, can have great Stuff or be Ineffective. The quality of a defense shows through by turning hits into outs or allowing outs to become hits. Each batted ball takes into account hit location that easily integrates the range of a fielder. An easy yet detailed baserunning model that combines hit location, base runner ability and the arm strength of the fielder. A double-sided Play Result Card Deck which combines with a GAME CENTER Chart that dictates what Individual Player Actions are used to arrive at a play result. Supplemental Charts are used as well. A Computer Driven System that automates game play with a Macro-Enabled GAME CENTER Excel file that is easy to learn and follow. It is an exact replica of the board game. Fully Customizable Player Cards. Each Season you purchase is delivered to you digitally in Excel File Format. This way you can customize the players as you desire. You can add player nicknames, team colors or even a logo or other image to each player card. In SIDELINE FOOTBALL, for example, you an cut and paste individual cards into a Team Sheet if you choose. For each sport, you print only the players you choose. Season Replays are a Focus of FTP Sports Games. Each Season purchased contains that season's schedule. Each Season also contains a Statistics Folder that provides a LEAGUE REGISTER for Team Statistics and an INDIVIDUAL REGISTER for Individual Player Statistics. These are linked to a TEAM STAT BOOK for every team in the league. 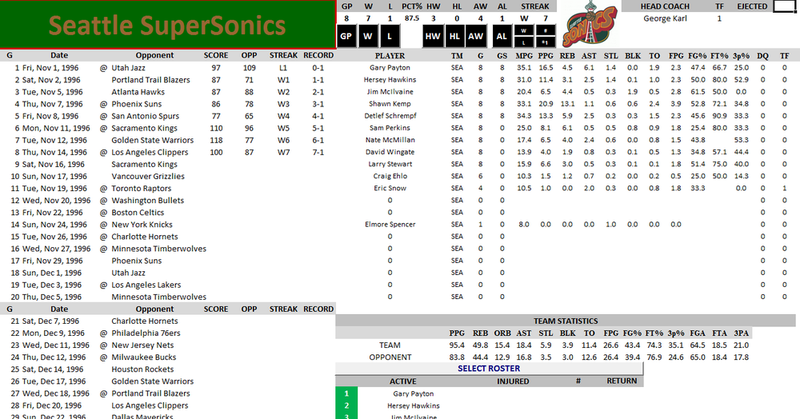 The Computer GAME CENTER keeps track of the statistical results you assign to each player. 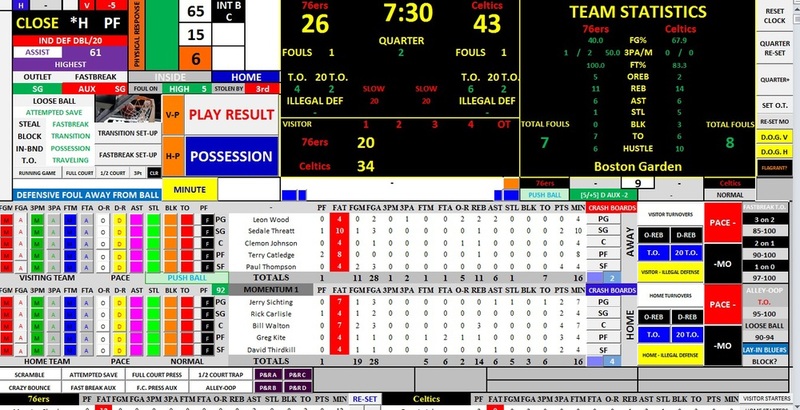 At the end of each game, those statistics are easily moved to a TEAM STAT BOOK which then links to the LEAGUE and INDIVIDUAL REGISTERS. This provides texture to your Seasonal Replays as the story lines develop around who is playing well and who is under-performing. Draft Leagues are a Focus of FTP Sports Games. Within each Season and Team available, every player has his own individual card that Leagues can draft and assign to individual teams. 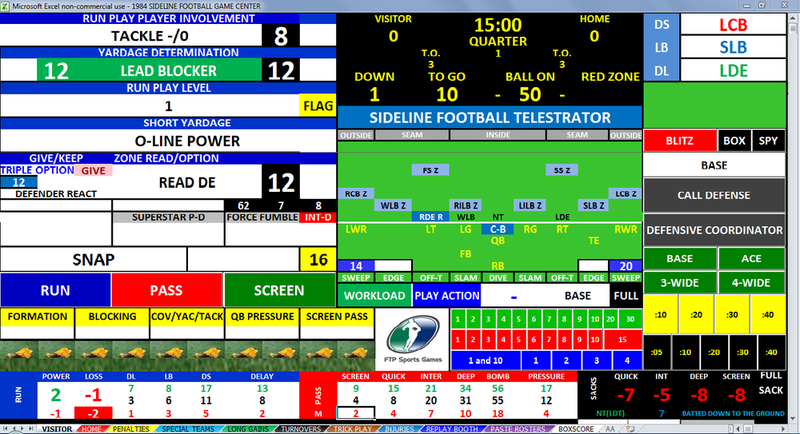 Example Images From Sideline Football *Some items have been customized - this feature available after digital delivery. All images shown are property of the individuals and websites they were loaded from and are intended for individual use. 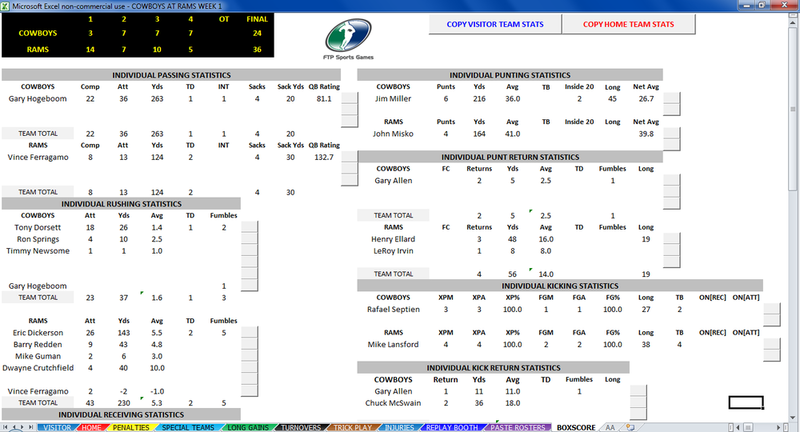 Example Images From Sideline Football*Some items have been customized - this feature available after digital delivery. All images shown are property of the individuals and websites they were loaded from and are intended for individual use. 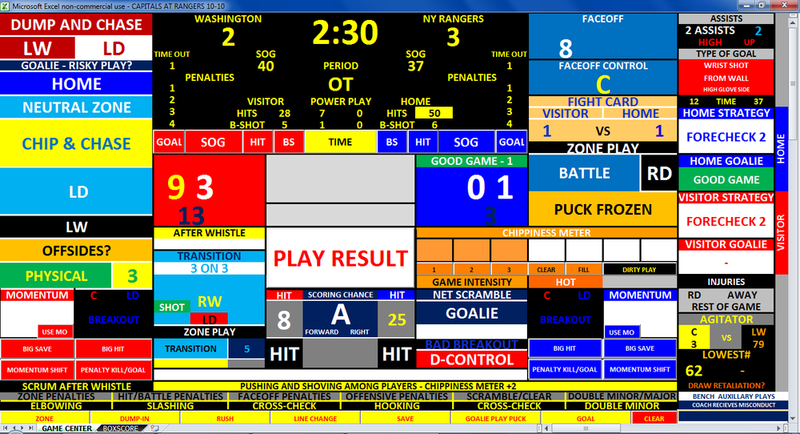 Example Player Cards for Sideline Football, Courtside Basketball, Rinkside Hockey and Dugout Steps Baseball*Some items have been customized - this feature available after digital delivery. All images shown are property of the individuals and websites they were loaded from and are intended for individual use. 2019 FTP Sports Games all rights reserved.